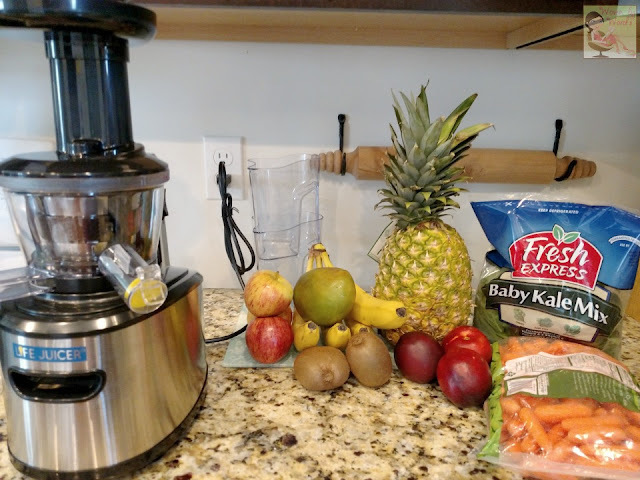 A couple of my blogging friends had suggested getting a juicer because I had been talking about trying to add a healthier element to my diet. I thought it was a great idea except for he fact that I didn't know a thing about juicers. That's when they suggested I get in touch with Viatek because they had used their juicer in the past! Well, sign me up! 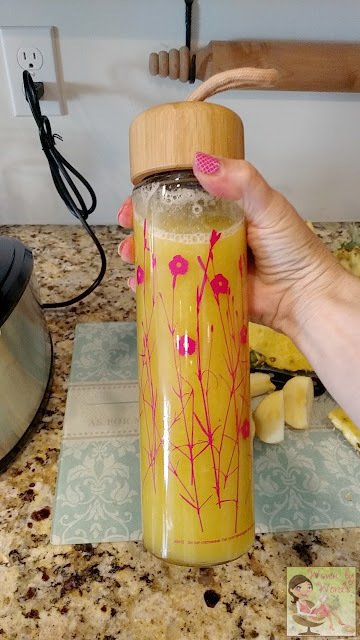 I was sent the Life Juicer to review, and guess what? I'll be giving away one this coming weekend! I had been feeling so amazingly cruddy about my health and the junk I've been feeding it. We've been running around a lot, which also translates into eating out a lot. When it was just the boys and I, we rarely ate out. It was a luxury. Our bodies still aren't used to it. We go out to do some running around, we grab fast food. After church we grab fast food. Visit with my parents, hey let's go out to eat. While there's nothing wrong with grabbing dinner out occasionally, doing it nearly every day is crazy and unhealthy. I needed to start adding a healthier element to my life! I figured juicing would be a great way to do that. The only thing I had to do was figure out what I liked, and start making juices. So, in reading the booklet, I realized that juicing has a purpose outside of just giving us a healthy drinking option. What I like with most of the recipes is the explanation of what the purpose is for each one. Now, my favorite recipe is from the Digestive System category. It's the "digestion regulator," which wasn't something I was going for, but I had the ingredients, and it sounded good. I could always use some help regulating my digestion. It's been extremely easy to get to know the Juicer! The instructions to assemble it were easy. You're basically just stacking the pieces. You just have to do it in the right order. Cleaning it is just as easy and it comes with a brush to clean the strainer. The obvious precautions are to not put your hand inside any of the pieces when it's on. As you put a piece of fruit in, it passes through each of the pieces. On the right side is where the juice, and on the left the "fruit poop" aka the pulp comes out. I haven't made enough juice at once to need the collector. I actually thought there'd be a lot more unused parts of the fruit than there actually was. The fruit cut right through the juicer, and within minutes I had my own juice! Can't get much better than that! Well, except now I want my own fruit trees and a spot to grow pineapple! 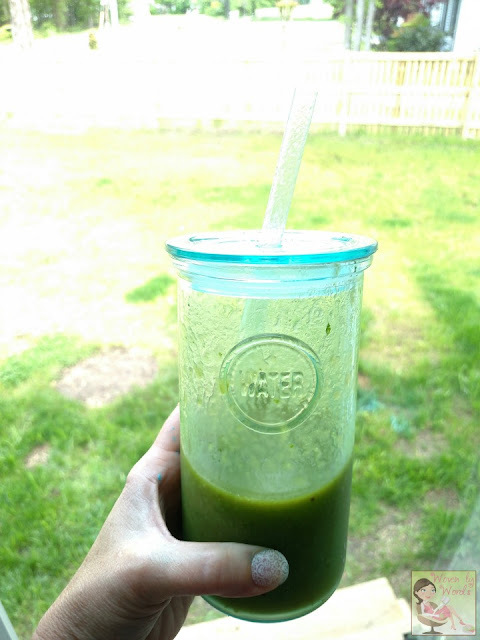 I've actually gone out of my comfort zone of the fruits or vegetables I usually consume because of the juicer. I bought kale the other day! Shocking, I know. I think I might stick with spinach though. Heck, add just about anything in with pineapple, and we can call it a day. The only issue I've found is that I go through my juice really quickly. I think it might have to do with it being so fresh. Oh my gosh, and it's SO filling! It's juice, how can that be filling? But I tell you what, it is! That's what I'd prefer to fill up on anyway instead of all the other junk that's around me. 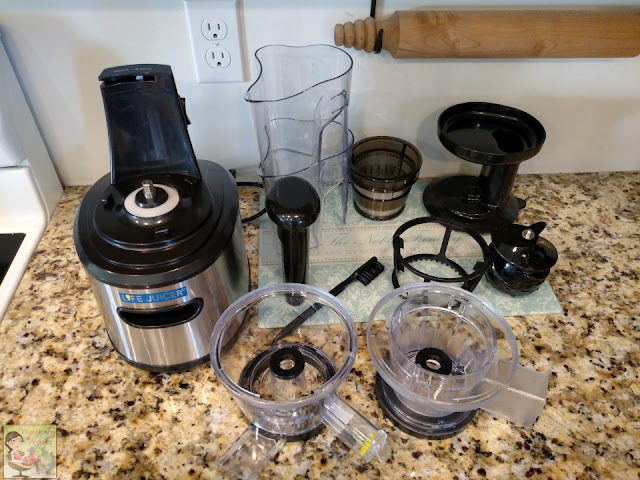 Now that the warmer weather is here, and the rain that filled up the month of May is gone, I'm looking forward to trying the frozen treat attachment that comes with the Life Juicer! It should be super easy to use since all you're doing is using frozen fruit! Really, I need my own produce section in the backyard. Be sure to follow Viatek on their social channels: Twitter, Facebook, Pinterest, and Instagram! I would love to have this juicer and I think it's fantastic that it has the nine different topics. What more could you ask for? I'm thinking this would be a great gift for my family to get for me. Thank you for sharing it. 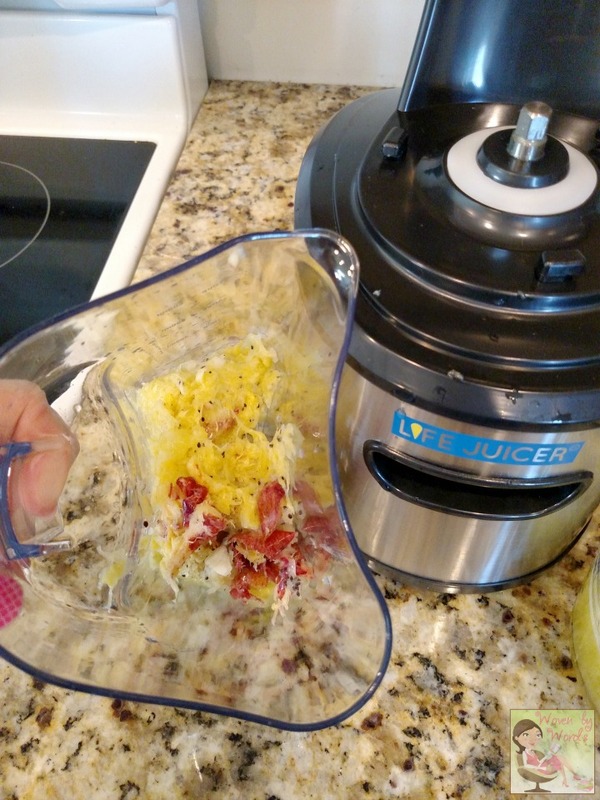 There are so many great parts and uses for this juicer. I would love to make all the recipes. Instead of going to the smoothie place, I can make my own!! I would love to use juice to help my husband and I on our diets and to introduce some veggies into my grandson and my husbands diet. I love the juicer. I would love to try out these yummy recipes. I have always wanted to try a juicer, I love the health benefits and it just sounds delicious! :) The recipe book that comes with this sounds like a very handy thing to have, especially if your new to juicing. Looks like such a great juicer! I would love to have one and be able to have fresh juice for breakfast every morning. I really like this juicer. I had one ages ago and the pulp removal was horrid. I compost, and would be able to retrieve the leftovers on ths one easily. I also like how compact it looks. 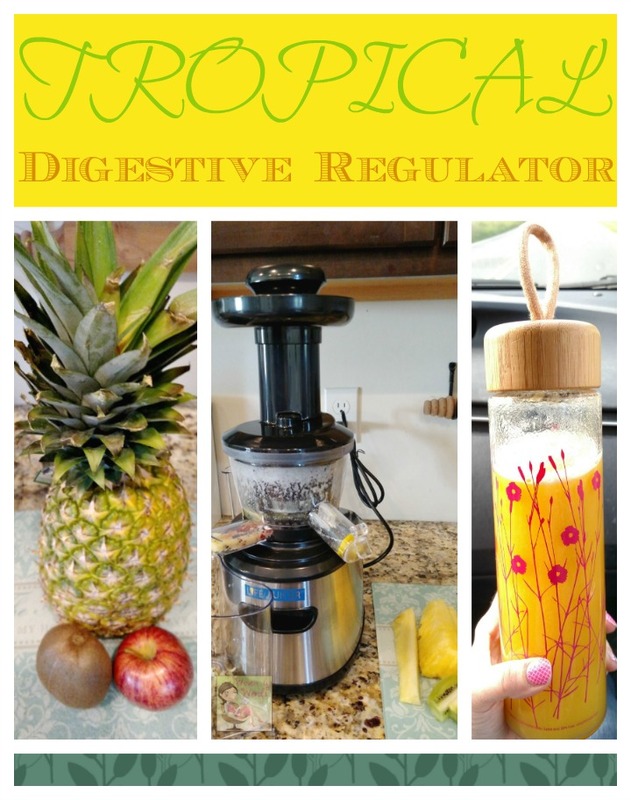 I would want this juicer for the digestive system and to get more fruits in my system.